When birds nest in a home or other structure, damage is almost unavoidable. In order to prevent issues with the flue, gutters, and other areas, you’ll want fast and effective bird removal services. At Nationwide Pest Control, you’ll have access to bird control specialists with the ability to effectively remove bird’s nests from your home. 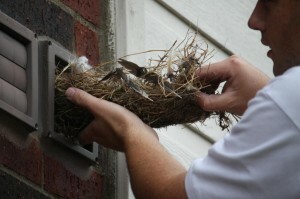 Through humane and safe removal services, you’ll have peace of mind that you can put an end to bird nest problems. Let Nationwide Pest Control assist with bird control and removal services to prevent damage to your home. For immediate assistance with a nesting problem, call us today. When in search of the leading providers of bird control services in Sydney, Wollongong, and Blue Mountains, the Nationwide Pest Control team is standing by to assist. For a Free quote for any of our services, contact the Nationwide Pest Control team. Call us on 1300 76 53 58.